Today, after four decades of existence, Arrowhead Stadium remains one of the finest stadiums in the NFL. The history of the club begins in Dallas when they were known as the Texans. Owner Lamar Hunt moved the team to Kansas City in 1963, renaming them the Chiefs. For nearly a decade, the Chiefs shared an aging Municipal Stadium with the Athletics and Royals (MLB). By the mid 1960s the City of Kansas City began exploring sites to build a new stadium, but failed, leading to the establishment of the Jackson County Sports Complex Authority to acquire land, design, construct and obtain funding for a new stadium. Original plans were for a multipurpose stadium, but were scrapped because of design and seating capacity issues. Unlike many other cities that built multipurpose stadiums, the county decided to build two new stadiums, one for baseball and one for football. In June 1967, a $102 million bond was issued for construction of two sports stadiums. Construction on the Truman Sports Complex began on July 11, 1968. A rolling roof was part of the original design for both stadiums, but did not materialize because of cost overruns and project delays it would cause. After over four years of construction, the stadium was completed in time for the start of the 1972 season and named Arrowhead Stadium. The Kansas City Chiefs played their first game at Arrowhead Stadium on August 12, 1972 against the St. Louis Cardinals. The stadium was a marvel for its time because of its great sightlines and it was not multipurpose, like many other stadiums built during the 1970s. Over 79,000 red and gold seats in three tiers enclosed the entire Astroturf playing surface. Offensive Player of the Year Priest Holmes in 2002. Fourteen Pro Football Hall of Fame enshrines. 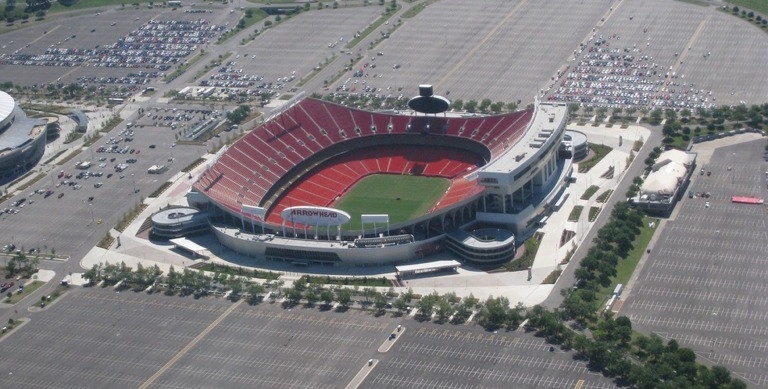 Since its opening in 1972, Arrowhead Stadium has underwent numerous changes. In 1984, officials discussed adding a dome to Arrowhead Stadium, but the idea was dropped due to high construction costs. A JumboTron videoboard was added above the upper deck rim in the south endzone in 1991 and the Astroturf playing field was replaced with grass in 1994. In 1999 and 2000, all 79,000 seats were replaced with new seats. In August 2007, the Chiefs unveiled a massive renovation plan, keeping Arrowhead Stadium up to par with the newest stadiums in the NFL. Completed by the 2010 season, renovations and additions included a refurbished club level, restaurants and concession areas, an expanded team store, and a Founders Plaza on the stadium’s north side honoring the former owner, Lamar Hunt. This project also included the construction of the Horizons Level atop the upper deck on the south side of the stadium that includes a new pressbox, luxury suites and premium seats. No major changes were made to the seating bowl. However, the overall capacity decreased to 76,416. Located on the lower-level concourse, the 28,000 square-foot Chiefs Hall of Honor, highlights great teams and players, and exhibits artifacts from the Chiefs’ history. New HD video/scoreboards replaced the existing scoreboards located above the stands in both endzones. 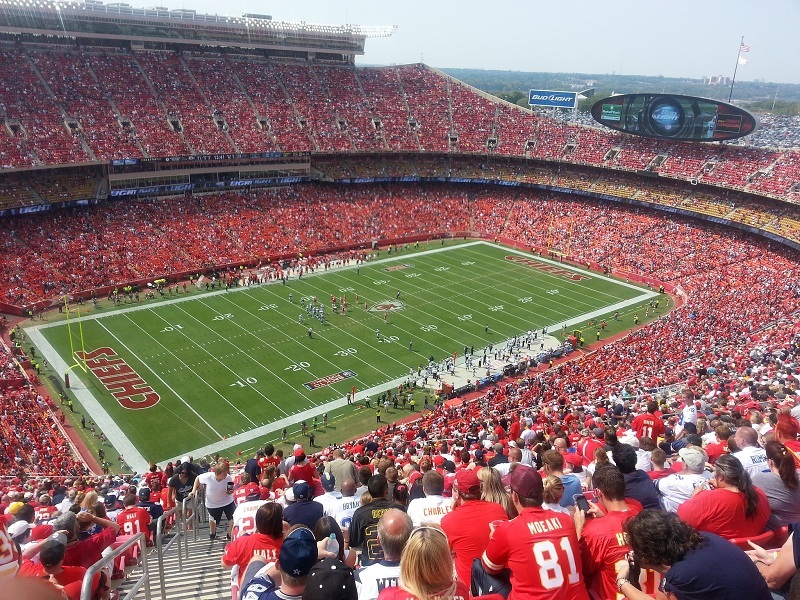 Arrowhead Stadium is known as one of the loudest stadiums in the NFL and the Chiefs are known as having one of the best tailgating experiences in the NFL, much like what is found at college football games.